Add zing to your iced coffee! If you wish to add a little pep to your iced coffee while keeping it refreshing, you should grab a strip of lemon peel. The other night a visiting friend encouraged me to try an espresso martini, and I obliged because I am a polite and amicable host. 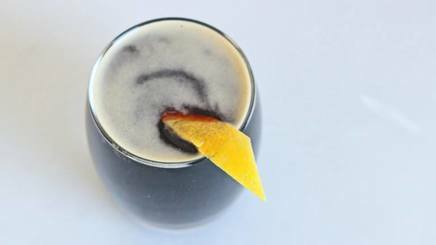 The sweet and strong coffee drink could have veered into cloying territory, but the presence of lemon oil rounded it out beautifully, playing off the coffee's bitterness and the liqueur's sweetness. Lemon oil, expressed from a strip of zest, does much the same thing in a glass of cold brew, particularly if you add a little simple syrup in there. Hold the peel yellow-side down over your cold coffee of choice. Squeeze it to express the oil, then rub it around the lip of the glass. Take a sip, and become caffeinated and refreshed.